"That bridge was an eyesore," Mayor Rahm Emanuel said at a ribbon cutting Monday. ROSCOE VILLAGE — The remaking of the Western-Belmont-Clybourn intersection began 16 months ago with the ear-splitting clang of hydraulic excavators and ended with the soundless snip of a pair of ceremonial scissors. 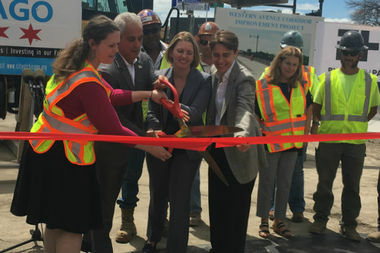 At a ribbon cutting Monday afternoon, Mayor Rahm Emanuel declared the construction project officially complete, a month early and on budget. The project kicked off in March 2016 with the demolition of an aging and outdated viaduct at Western and Belmont, constructed in the 1960s to manage traffic flow around the now defunct Riverview Amusement Park. "That bridge was an eyesore," Emanuel said. Aesthetics aside, the overpass no longer met engineering standards and had been deemed "structurally deficient." Officials also argued that it provided a physical barrier to development, impeding the flow of retail shops and restaurants. A five-leg grade-level intersection at Western, Belmont and Clybourn replaced the viaduct. The intersection now has three lanes of traffic in each direction during rush hours, with curbside parking in some areas during off-peak hours, according to the Chicago Department of Transportation. Traffic signals have been programmed for the new configuration and have the capacity to provide "Transit Signal Priority" for CTA buses, speeding up bus service, officials said in a statement. The scope of the project included numerous repairs and improvements, many of them aimed at increasing pedestrian safety, along a stretch of Western Avenue between Waveland Avenue and Logan Boulevard. "Our hope is that it creates a safer environment and enhanced traffic flow while helping to improve the quality of life for the surrounding neighborhood," said Rebekah Scheinfeld, CDOT commissioner. The project cost $27.3 million and was funded through a combination of federal, state and Tax Increment Finance dollars, according to a statement from the Mayor's Office.